Jacob Yost Shantz (22 May 1822-28 October 1909), of Berlin (now Kitchener), Ontario, for many years a promoter of the Mennonite settlements in Manitoba, was the eighth child of Jacob and Maria Yost Schantz, of Montgomery County, Pennsylvania, who had purchased a farm in what is now Kitchener. The son's interests soon extended beyond his vocation of farming. Fruit growing, maple sugar production, and the operation of a sawmill were added to his activities. Later he entered the building and contracting business. He promoted various industries in his city, the chief being the Dominion Button Works. 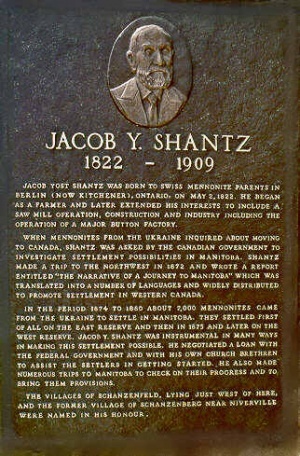 Shantz was easily the wealthiest Mennonite entrepreneur in Ontario in the early 1880s, with more than 300 people on the payroll of his Dominion Button Works alone. Over-expansion and possible mismanagement in a declining market led to virtual bankruptcy by 1886. Shantz spent the rest of his life paying his debts, and died a man of moderate means. For 27 years Shantz served on the Berlin school board. In 1882 he was elected mayor of Berlin (Kitchener) in an uncontested election. Inexplicably, he resigned four days after taking office, though the town council briefly considered not accepting the resignation. The fact that J. Y. Shantz's son, Moses, was also elected as a member of the council may have generated pressure for one of the family to resign. Shantz's letter of resignation has not survived. Shantz's chief public contribution, however, lay in the promotion of Mennonite immigration to Manitoba. In 1872 as a representative of the Canadian government Shantz accompanied Bernhard Warkentin, who represented the prospective Mennonite immigrants from Russia, on a land inspection trip to Manitoba. The Canadian Department of Agriculture published Shantz's report under the title The narrative of a journey to Manitoba, which became a history-making pamphlet, going through various editions with a total circulation of several hundred thousand. During the next 35 years, Shantz made many trips to Manitoba, the twenty-seventh and the last in his 85th year. His work consisted in assisting the Mennonite immigrants who wished to settle in Manitoba with transportation and supplies, as well as helping them settle on the land. By November 1874 it was reported that 1,400 Mennonites had been placed in Manitoba and five years later the number had grown to over 7,000. Shantz not only obtained most favorable travel rates for the immigrants but often used money from his $100,000 personal credit fund in a Berlin bank to assist his friends from Russia by helping pay their transportation costs, equipment, and farm machinery. Shantz was also placed in charge of the $100,000 Canadian government loan to the Russian Mennonites, guaranteed by the Ontario Mennonites. As treasurer of the "Aid Committee of Ontario" Shantz also dispensed the funds loaned to the immigrants by his fellow Mennonites. He lived to see the day when all of these loans were repaid, the final settlement having been made in his 85th year. In 1893 Shantz began promoting Alberta land and here again future developments proved his business judgment and vision. Shantz became a member of the Mennonite Church (MC) at an early age. In 1875, desiring a more progressive church, Shantz became a member of the group later to be known as the Mennonite Brethren in Christ. For 18 years he served on the Managing Committee of the Gospel banner and for at least eight years on his denomination's Foreign and Heathen Missionary Society. He was always deeply interested in the temperance movement and a defender of Biblical nonresistance. In 1898 Shantz joined the local Christian Science congregation, and remained a member in good standing until his death, although evidence is inconclusive on the question of whether he remained actively involved to the time of his death in 1909. He was still an active member, serving on the congregation's board of directors, at age 81 (1903). Four factors help to explain Shantz's interest in the then-new Christian Science movement. (1) Shantz had a lifelong interest in the innovative, whether in business, land settlement, or religious thought, though he always believed himself to be orthodox. (2) The emphasis in Christian Science on a rigorous, healthful lifestyle was appealing. Shantz was active in the temperance movement, and was a vegetarian at least part of his life. (3) Jacob Y. Shantz was a "healer" with a reputation for curing cancer. Although his approach differed from that of Christian Science, enough common interest existed to prove attractive. (4) Shantz probably felt rejected by the Mennonite Brethren in Christ (United Missionary) denomination as he was phased out of all leadership roles by 1896. Although Shantz was a quiet and unassuming man, his voice had a deep, organ-like tone that people did not forget. He was married three times, in 1843 to Barbara Biehn, in 1853 to Nancy Brubacher, and in 1871 to Sarah Sherk. Two sons and three daughters were born of the first marriage, and three sons and four daughters to the second. Shantz was buried in the First Mennonite cemetery in Kitchener. Gingerich, M. "Jacob Y. Shantz, 1822-1909, Promoter of the Mennonite Settlements in Manitoba." Mennonite Quarterly Review 24 (July 1950): 3, 230-48. Gingerich, Melvin, "Jacob Y. Shantz," in From the Steppes to the Prairies, C. Krahn ed. Newton, KS, 1949: 92-97. Reimer, Gustav E. and G. R. Gaeddert. Exiled by the Czar. Newton, KS, 1956. Steiner, Samuel J. Vicarious Pioneer: the Life of Jacob Y. Shantz. Winnipeg: Hyperion Press, 1988. Jacob Y. Shantz Manuscript collection, Mennonite Archives of Ontario. Gingerich, Melvin and Sam Steiner. "Shantz, Jacob Yost (1822-1909)." Global Anabaptist Mennonite Encyclopedia Online. April 1999. Web. 22 Apr 2019. http://gameo.org/index.php?title=Shantz,_Jacob_Yost_(1822-1909)&oldid=143746. Gingerich, Melvin and Sam Steiner. (April 1999). Shantz, Jacob Yost (1822-1909). Global Anabaptist Mennonite Encyclopedia Online. Retrieved 22 April 2019, from http://gameo.org/index.php?title=Shantz,_Jacob_Yost_(1822-1909)&oldid=143746. Adapted by permission of Herald Press, Harrisonburg, Virginia, from Mennonite Encyclopedia, Vol. 4, p. 511; vol. 5, p. 819. All rights reserved.